The prankster Shifty McSly is sneaking around Little Newbury and mysterious things are happening. Shockingly, six precious, rare books have disappeared from the library! The town's clumsy detective, Fergus Finn, has taken on the challenge of finding the books but librarian Linda Landon knows he'll need assistance and asks for help to solve the case. She has even promised a reward for finding the missing books! Send the kids on a mysterious journey by playing the Detective Adventure. 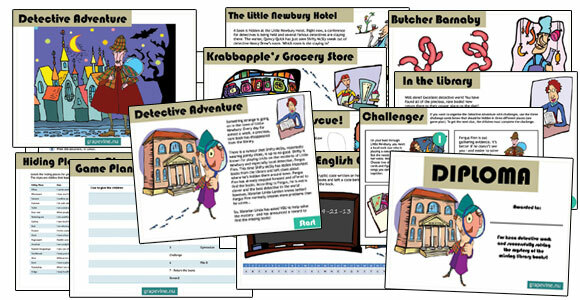 Like all of our treasure hunts, the Detective Adventure is a unique product that is clever, fun and specially adapted for children. With the help of our well-designed guide and game plan you can easily organise an expert treasure hunt, at home or away, inside or outside. The treasure hunt works anywhere! The kids follow clues that lead them to brain-teasing puzzles and challenges that must be completed in order to find the missing books. The Detective Adventure works in a wide variety of contexts: at a birthday party, an activity for a children's group, at nursery or daycare or simply to add entertainment to an event. The treasure hunt is easy and quick to prepare, taking no more than half an hour to set up. Everything you need is included in the product that you print out yourself - nothing else is required! - diplomas to hand out at the end for keen detective work!